Upon approaching the subject of Palestinian sports in general, and football in particular, it is almost universally acknowledged that this blossoming sport movement is faced by a number of deterrents and obstructions, amongst which the Israeli occupation stands out as the main restraining force. Football, as one of the world’s foremost sports, is all about bringing people together, promoting ethics, and building bridges of friendship between nations, based upon the values of peace and fair competition; yet the circumstances the Israeli occupation is creating for Palestinian football are confiscating the rights and hurting the morale of young football players who can only interpret these restrictions as racist measures meant to undermine their future as athletes. It maybe worthwhile to mention that the grievances that Palestinian sports are suffering at the hands of the Israeli Occupation were not born yesterday. They are as old as the occupation itself. Unfortunately, the writer of this article had started to collect and record them only in 2008, when the writer became involved in the Palestine Football Association (PFA), and had observed that the Israeli occupation was interfering in the PFA's rights and obligations to organize, practice, and develop the game. 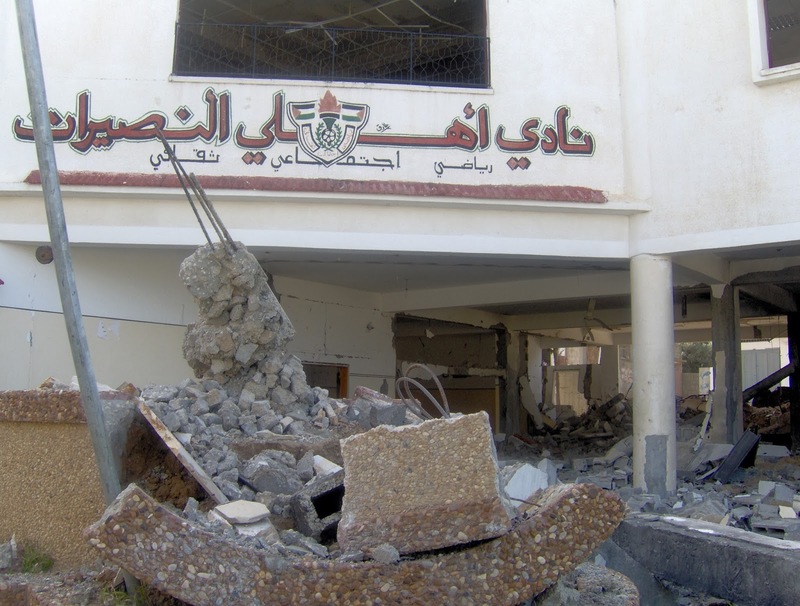 Whereas some reports were about a player -or a team- being denied the right to move and join a squad, or participate in a competition, other reports cried out the names of players or officials being killed, injured, or detained without cause; Sport facilities demolished or broken into; The building of FIFA Goal projects being halted and denied by the Israeli occupation. It was then that the writer started to sort and categorize the incidents in an attempt to understand them and perhaps find solutions. The magnitude of what was happening was threatening the growth and development of the budding football in Palestine, and seriously interfering with the PFA rights and obligations as stipulated in Articles 13 and 14 of the FIFA statutes. Whether this occupation intends to hinder, destroy, impede, or control Palestinian sports is not the subject matter of this paper; the author would rather leave the answer to this controversial question to serious researchers who are invited to explore, and then decide. What this brief study observes are the methods relentlessly employed by the Israeli Occupation authorities that restrain the growth of football in particular, and sports in general, through a series of procedures, restrictions, and actions that the paper tries to cover and give examples on. 1. Human rights’ violations and racism: Constant human rights violations against athletes and sport officials including killing, injuring or arresting them. It also includes racist violence against Israeli Palestinians inside Israel by Israeli right-wing clubs and fans. 2. Movement of people: Restrictions on the movement of players and officials in and out and within Palestine. 3. Infrastructure: Banning the building -or hindering the completion of stadiums and other infrastructure, and sometimes destroying existing ones. 4. Movement of sport goods: Restrictions on the movement of sport goods (including documents and team clothing kits) in and out of Palestine. 5. Political intervention: Interfering in the organization of friendly matches between Palestine and other Associations. 6. Administrating football activities in the territory of another association: By allowing illegal settlement to build football facilities, and the IFA to organize football on internationally-recognized Palestinian territories. 7. Prohibition on Palestinian Sport activities in Occupied East Jerusalem. 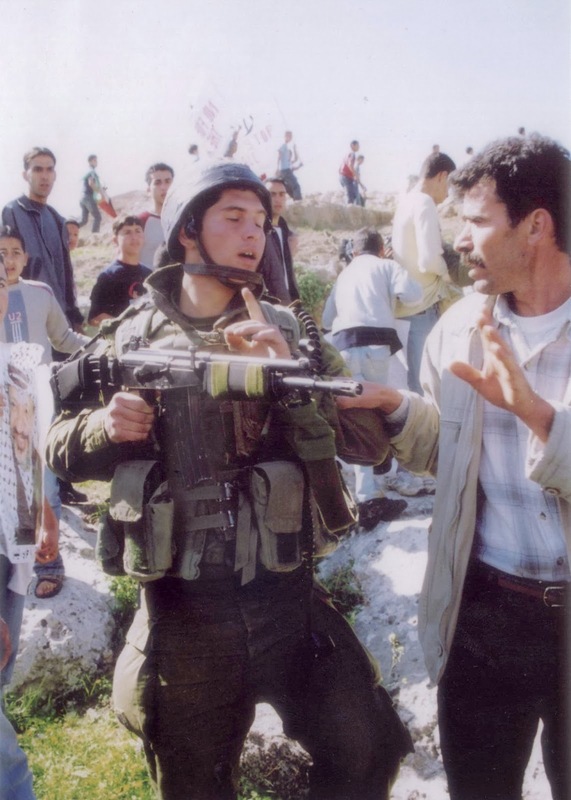 The list of human rights’ infringements, committed by the Israeli occupation, is endless. The list includes racist actions by Israeli clubs and fans against non-Jewish players and fans in total disregard of the basic rights stipulated in the FIFA statutes and the Olympic Charter. Below are but a few examples. Shadi Al-Sbakhi: Al-Nusseirat Club player. Got killed during an Israeli bombardment of Gaza. Player Mahmoud Kamel Mohammad Sarsak: imprisoned by Israeli authorities for more than 3 years without trial ever since the 22nd of July 2009. He was arrested by the Israeli forces as he was on his way from Gaza to the West bank to play with his new club, Markaz Balata. He was released in 2012 after 90 days of being on a hunger strike, and was only released after the much appreciated intervention from the President of FIFA and other sport governing bodies. 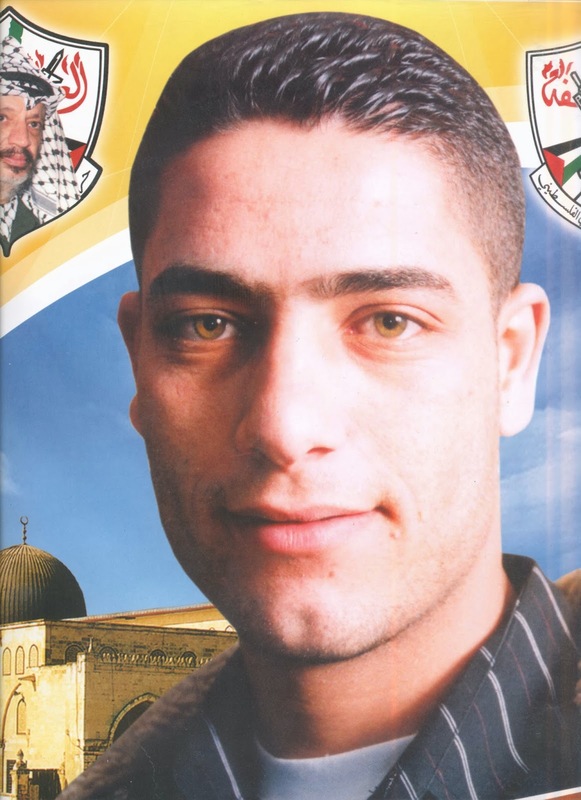 On 24/3/2010, and in one of the holiest of the holy places for Muslims –Al-Aqsa Mousque, Israeli Police and Border Guard forces arrested Jamil Abbasi, the Islami Silwan Club’s head Coach, and threatened him to not partake in any sport activities. He was re-arrested again in 21/2/2012 for the same reasons. 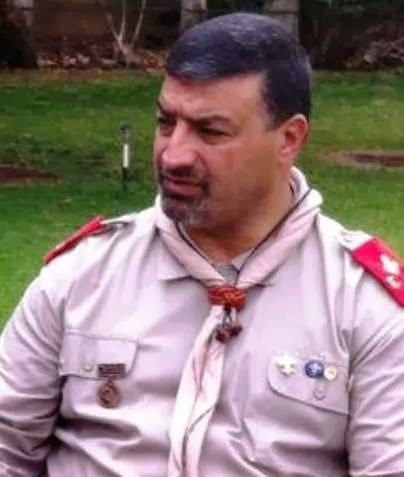 On 4/2/2011, Israeli Police forces arrested the Chairman of Silwan Club, Mr. Ma’moun Abbassi, and threatened him of permanent arrest if he partakes in any sport activities in Silwan/Jerusalem. He was re-arrested in 10/2/2013, and led to an interrogation camp south of Jerusalem, where he was banned from partaking in any sport activities. It’s worth mentioning that Mr. Abbassi is now subject to house arrest, and is banned from carrying out his duties as chairman of his club. 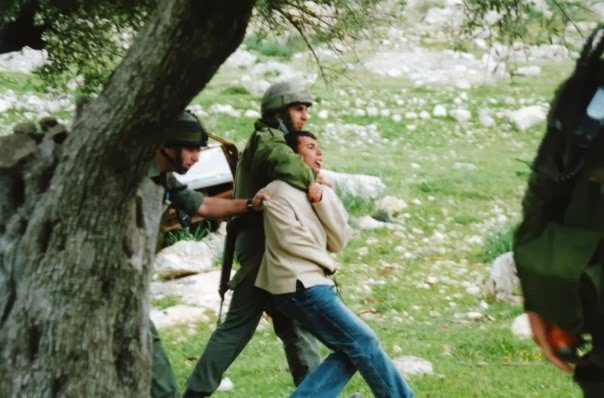 On 23/10/2011, Israeli special forces, accompanied by Israeli police arrested Mr. Kifah Sarhan, Board Member of the Islami Silwan Club, right from where he works in Beit Hanina/ Jerusalem. 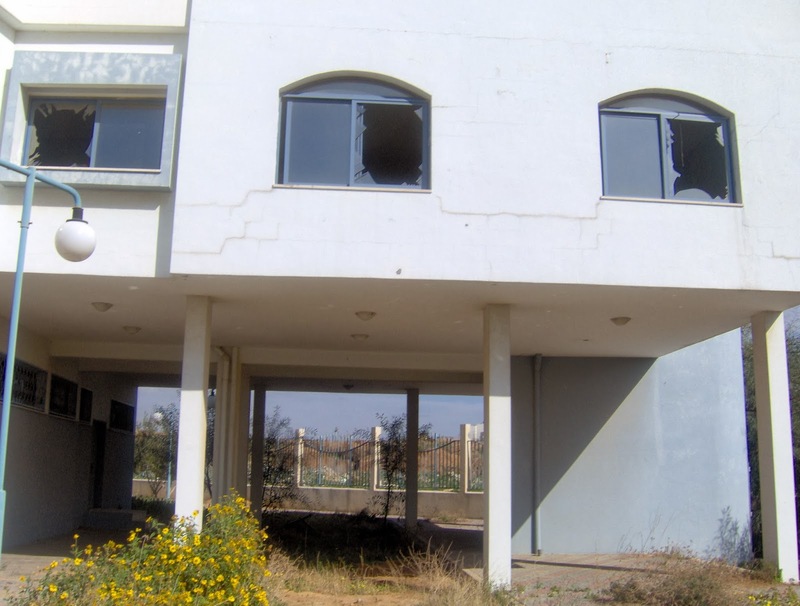 The arrest was followed by Israeli forces storming into Mr. Sarhan’s house, kicking out its residents and messing with the contents of the house. Omar Khaled Abu Rweis, the 24 years old Goal Keeper of the Palestine Olympic team, was abducted by an under‐cover Israeli military force from his work, in the Palestinian Red Crescent, without charges. He is still in detention since the beginning on February 2012. 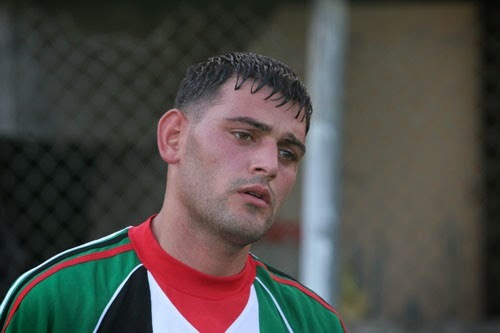 Player Mohammad Saadi Ibrahim Nimer, 23 years old, who plays for Al‐Amaari professional club was arrested by Israeli occupation forces in the end of February 2012 and is still detained without charges or trial. 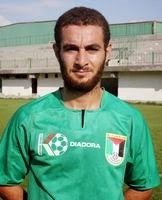 On 29/9/2012, a player in Jabal Al-Mukabber club, Ibrahim Wadi, was arrested on his way to Bethlehem where he was headed with his team for a professional league match . He was deported to Gaza from there. 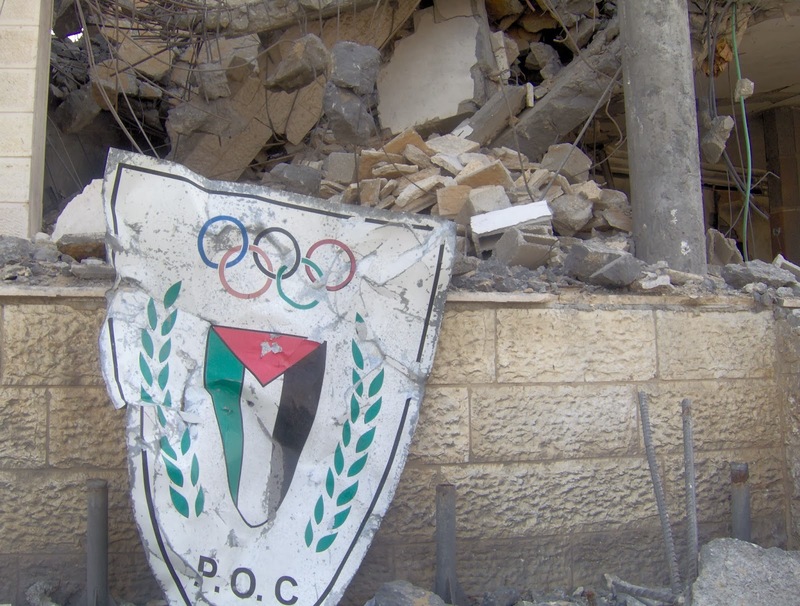 On 23/10/2012, Israeli Intelligence Forces, accompanied by Israeli Border Guard Forces, besieged the Islami Silwan club in east Jerusalem and gave them an order to close the club, under threat that any members who participate in sport activities will be arrested. The club had to withdraw from the 3rd class league after this order. It’s worth mentioning that, in March, 20013, the ban was renewed for another year. 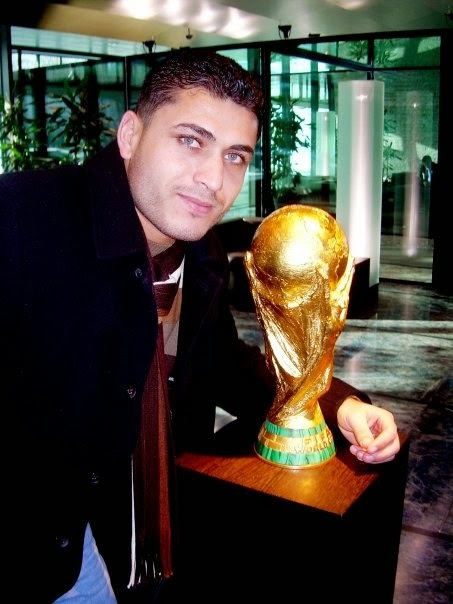 On 26/10/2012, player Imad Abbassi, who plays for Nadi Al-Muwathafin Club, was arrested by Israeli police and placed under house arrest, after being subjected to 6 successive arrests. 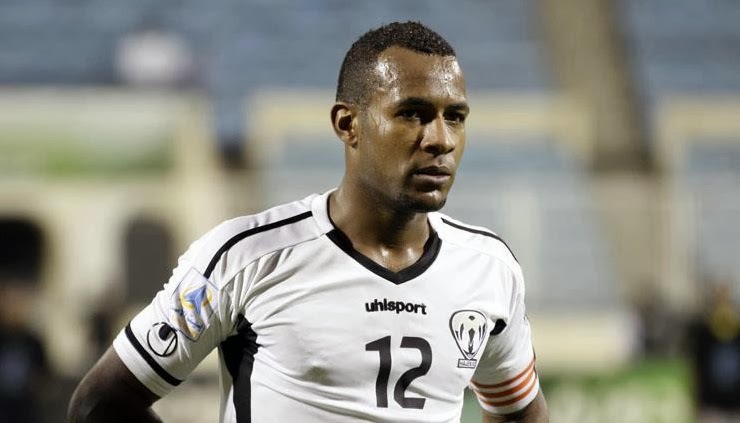 It’s worth mentioning that the abovementioned player used to play for Nadi Silwan, and had transferred to Al-Muwathafin club after the Israeli Occupation forces shut his former club. 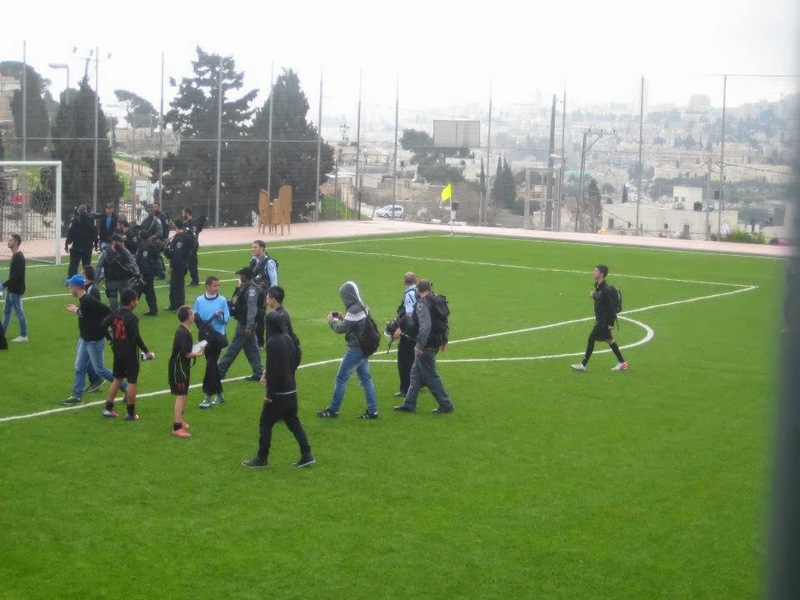 In February 2013, Israeli troops arrested 16 children who were playing football in the pitch of their school located in the village of “Tel”, near the city of Nablus. The boys learned that the Israeli occupation forces had kidnapped two of their group near the pitch, and had gone outside to see what happened when the whole group was kidnapped and taken to a military detention camp in Huwwarah. They were only released late at night, after lengthy talks between the Palestinian civil office and the Israeli military. PFA Board Member Mohammad Abu Swaiy, was detained by Israeli Police on 29/8/2013 for 6 hours. He was warned not to partake in any sport activities in the occupied city of Jerusalem. On 16/12/2012, and in the old city of Jerusalem, an employee of Al-Muwathafin Club, Mr. Nehad Sugayyar, was attacked by a group of Orthodox Israelis, under the eyes of Israeli police who –needless to say- refrained from intervening. He suffered several burns and bruises from said attack. 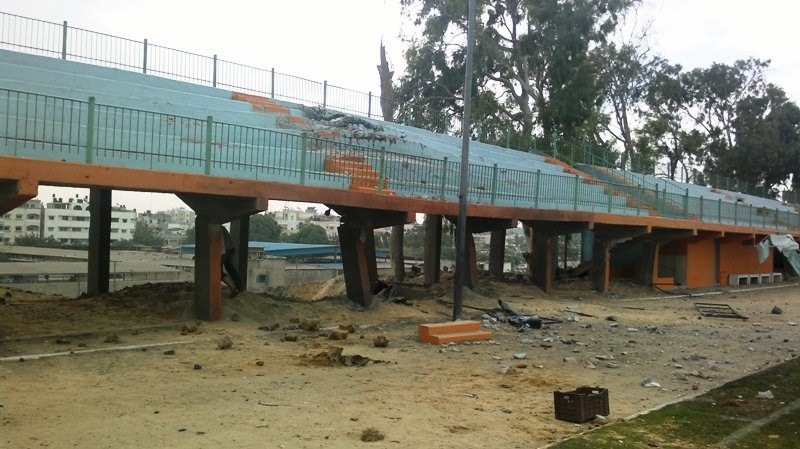 On the morning of the 3rd of January, 2013, an Israeli armed force broke into Faisal Al-Husseini Stadium, wrought havoc in the place and then savagely beat up a maintenance employee before taking him by force to an unknown location. The military armed force was preceded by another force in civilian clothing, also armed, who took photos of the location before the other force arrived. Israeli checkpoints prevent players and officials from moving freely between Palestinian cities and villages, which causes difficulty in bringing together all the national team players for training, and obliges the football association, and the other official sport bodies, to set up training camps outside Palestine. Players living abroad are, on many occasions, denied permits to enter the Palestinian territories, and players from Gaza Strip are denied access to the West Bank. The occupation authorities delay players for long periods at the borders leading to Jordan. This is exhausting and negatively affects their performance. It’s well worth noting that, between the years 2002 and 2004, Israeli Authorities had banned every Palestinian under 35 years of age from travelling out of Palestine. It is not permitted for Palestinians to freely move between Gaza and the West Bank. 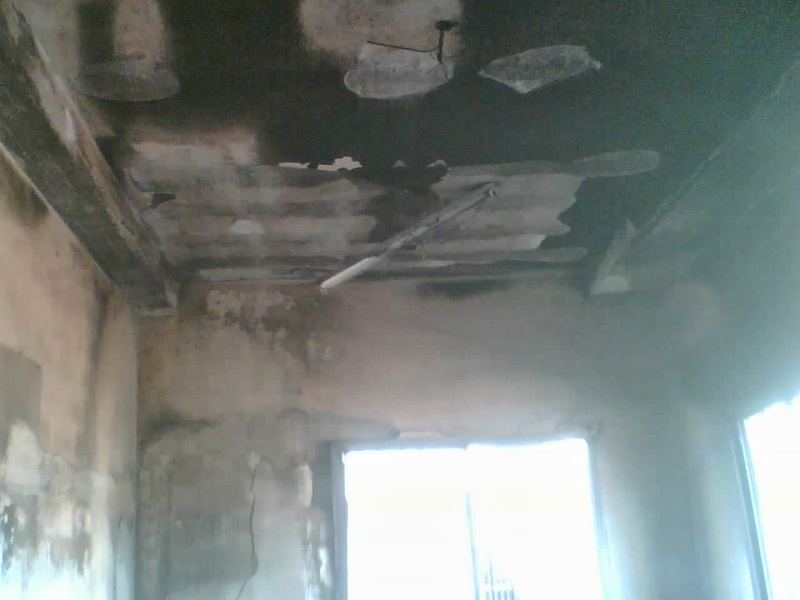 A permit from the District Coordination Office (DCO), is needed for that. 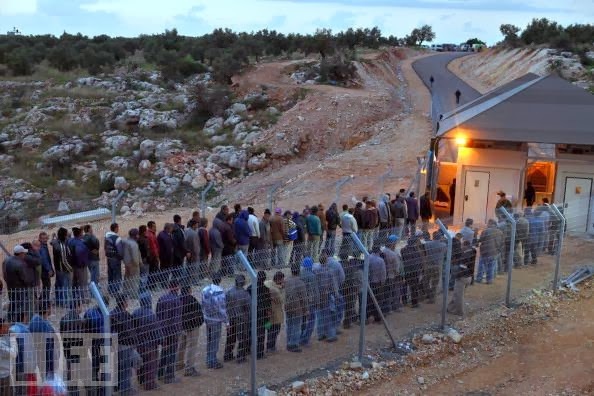 To obtain the permit, a Palestinian is obliged to state the reasons for the visit, and present an invitation, and then wait for God-knows-how-much; It can be 3 days, a month, or an eternity. Once the permit is obtained, there’s an expiry date to observe, and a new procedure to go through for renewal. One thing to be noted about the permit that a Gazan gets to visit the west bank, is that the permit is city-specific, so if you were a Gazan who got a permit valid for Ramallah, you would risk being deported back to Gaza if an Israeli check point caught you in the wrong city. Checkpoints may prevent players from travelling by restricting movement between cities, not to mention that security checks at Israeli checkpoints can be humiliating. Players Asem Hussein Attallah Abu Assi, Ihab Mahmoud Hamad Abujazar, Ahmad Nasr Khalid Keshkesh and Goal Keeper Mohammad Shbair, all residents of Gaza, have been denied entry to the west bank to join the national team in an international match in 2010. Shbair and Keshkesh had to stay in Jordan for more than 3 months -since the national team’s match in Sudan, in June 2011- before they were allowed to return to Palestine. 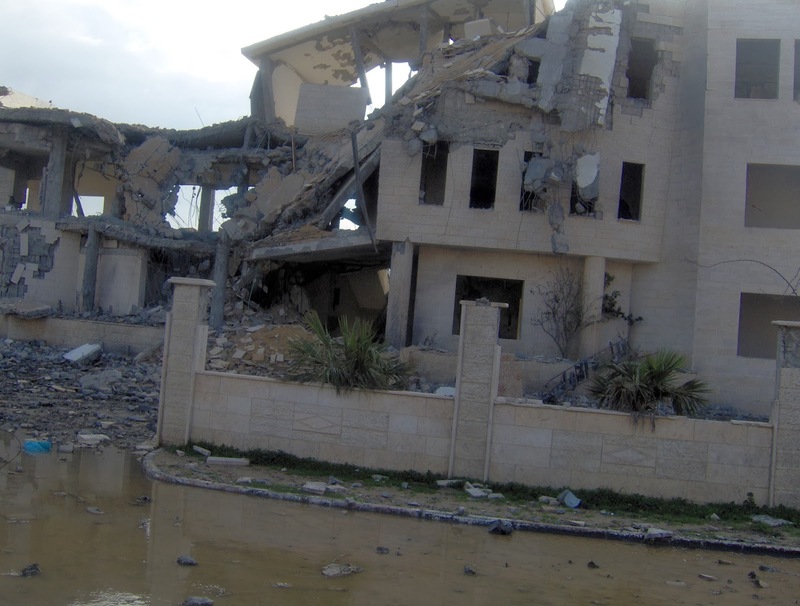 On the 29th of September 2013 PFA Board members from Gaza were denied entry to the West Bank. It’s worth mentioning that, until this moment, no Board meeting (that includes all board members from the west bank and Gaza) has been held in full quorum in Palestine since 2008 due to these Israeli restrictions. The only full meeting of the PFA Board was held abroad in Lebanon in 8/2/2012. On 18/8/2013, the PFA applied for a permit for Goal keeper Mohammad Shbair to visit his family in Gaza. It took years for him to finally get the permit. If from Gaza, he or she may not get a permit from the Israeli side to get out from Gaza to join the team in the west bank, so Gazan players have to travel separately and join their teams abroad. Facing obstruction and delay at the borders may result in players missing their flights. On 12/4/2013, the PFA applied for entry permits for Captain Jamal Mahmoud, head coach of the Palestine national team, and Makram Daboub, the Goal Keepers’ coach of the Palestine National team. Both were denied entry for months, and still face difficulties whenever they move in and out of Palestine. On 18/8/2013, the PFA applied for a permit for player Abdelatif Bahdari (ID. 800210361) to return to Palestine. Bahdari has been waiting in Jordan for two weeks, and, up until the moment this report was updated, we heard no word from the Israeli Authorities regarding his application. Visiting delegations, teams, coaches, referees, and other officials need permission from the Israeli authorities to enter Palestine, which might take 1-5 months. In September 2009, FIFA instructor, Mr. Nihad Souqar was denied a permit to enter Palestine and conduct a C Coaching course. The course was delayed as a result. In May 2012, Mr. David Borja, a high-ranking FIFA official was denied boarding his EL AL flight in Zurich by the Israeli security. They said they did not have enough time to check his security background, and he had to book another flight. On the 2nd of December 2012, Israeli authorities denied entry permits to 6 players and 2 officials from the Iraqi Air Force team who were supposed to play an official match against Al-Thahriyeh Club on the 4th of December. In February 2013, AFC Instructor Mr. Windsor John, an executive director at AFC, who was supposed to conduct an MO course in Ramallah, was denied an entry permit by the Israeli authorities without reason. On the 21st of February 2013, the Israeli authorities, despite attempts of intervention by countries such as Denmark, prevented 23 runners from participating in the International Palestine Marathon in Bethlehem without giving any reasons for the ban. 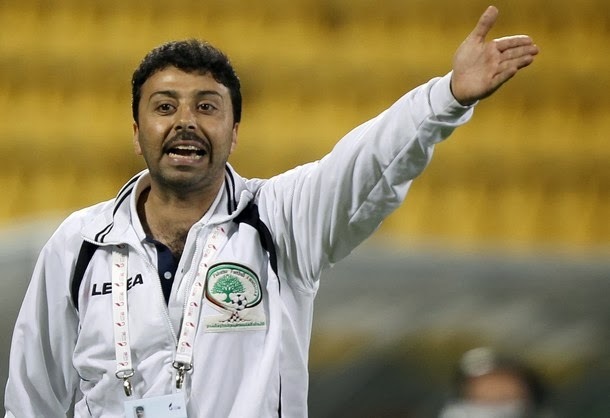 In May 2013, The PFA Women's department had to cancel one friendly match, and postpone the training camp (in preparation for the Women's Asian Cup Qualifiers) scheduled on 15/4/2013 because Mr. Hani Majdoubeh, the Head Coach, was still waiting for his permit in Amman/Jordan. The PFA had applied for the permit on 30/3/2013, and got it only on 12/5/2013. 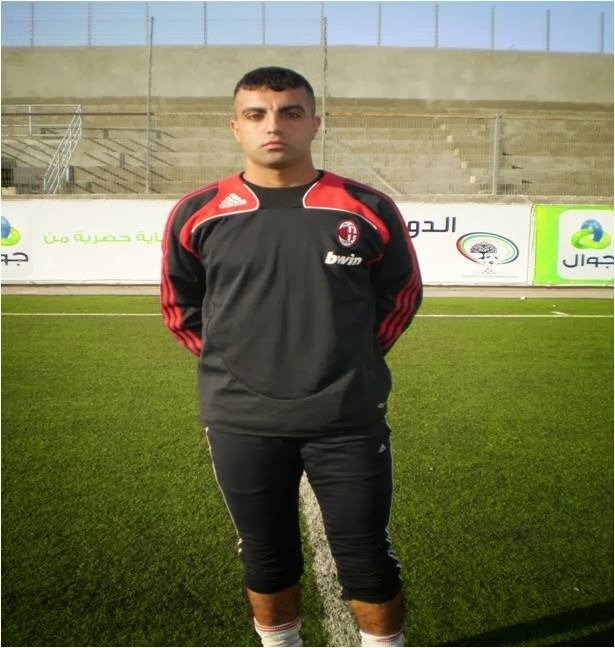 On 12/6/2013 the PFA applied for an entry permit for AFC instructor Mohammad Thiabat (Jordan). He was supposed to conduct a fitness course from 17-21/8/2013. 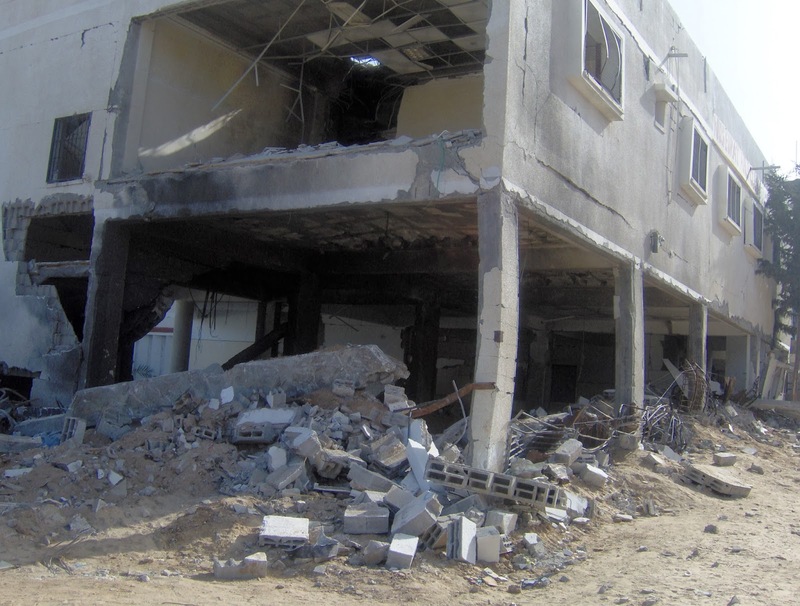 When no word was heard from the Israeli Authorities, the PFA re-applied on 16/7/2013. On 16/6/2013, the PFA applied for permits for 95 sport journalists, who wanted to cover the FIFA President’s visit of 7-8 July 2013. 64 journalists received approval, while 31 were rejected. In August 2013, the Israeli Authorities denied a whole delegation (from Iraq) entry permits to Palestine, under the pretext that Iraq was a “hostile country to Israel”. High ranking officials from Jordan, UAE, and WAFF (West Asian Football Confederation) were also denied entry permits. It may be worth mentioning that the Iraqi delegation, and the other officials denied, were travelling to Palestine –not Israel- to participate in the 4th WAFF Grassroots Championship (that was supposed to start on the 15th of August). It was after the intervention of UEFA, who prevailed upon their member association of Israel to intervene, that the main body of the Iraqi delegation was allowed to enter, on Friday the 16th, though. In the same above mentioned WAFF competition, Israeli Authorities initially denied entry to Mr. Fadi Zreiqat, the General Secretary of WAFF, although he had entered Palestine before. It was after the intervention of UEFA that he was allowed to enter. 3 Jordanian officials were denied entry. Also, in the same above mentioned WAFF competition, Israeli Authorities detained the buses of the players (all under 16 years of age) on the border for 6 hours without food or water, which was very traumatic for the kids. On the 31st of January 2014 , Mr. Ahmed Rifaie, a professional French boxer, came for a 3-day visit to Palestine to assess Palestinian boxers. He was hindered and handcuffed by the Israelis the Jordanian-Israeli borders (Al Karamah), and detained there for nine hours. After a rough treatment, he was handed over to the Jordanian Authorities and denied entry to Palestine. After A phone call to the French Embassy, he was advised to try again on the 2nd of February, which he did, though not without being detained for a few hours by the Israelis. 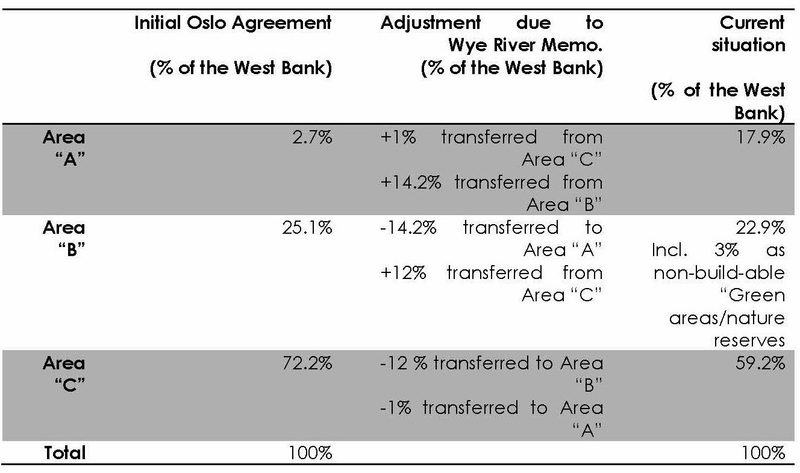 The limitations of “zoning” divisions imposed on the Palestinian National Authority (PNA) as defined in the Oslo Agreement: (Area “A” with full civil and security control by the PNA, Area “B” with Palestinian civil and security control but with overriding Israeli security authority and Area “C” with full Israeli civil and security control). The PNA has full authority on only 17.9% of the West Bank.In 2010, plans to build football artificial fields, financed by FIFA in places such as Burin, Beit Ummar and Beit Foreeq, were stopped by the Israeli administration for alleged “security reasons”. The Israeli civil administration -got away with the decision because these fields were located in Areas “B” or “C”. In Area “C”, construction is constrained by a very restrictive planning regime implemented by the Israeli Civil Administration and even sometimes by using references to a restrictive interpretation of the British “Mandatory Regulations Plans” dating back to the 40’s. Area “A” includes all Palestinian cities and their immediate surrounding areas, meaning that there is a very limited amount of land available for building includinga football field. Area “B” includes other housing zones such as smaller size cities, villages and some limited surrounding land, and potentially available land for sport facilities, but projects are blocked for “security reasons”. Area “C”includes an abundance of land suitable for building sports facilities, however building any infrastructure by the PNA is not possible. The documents requested by the Israeli authorities, to allow the building of sport facilities, include land ownership titles and deeds, detailed drawings of land levels, detailed drawings of the building, however the process is arbitrary without clear parameters nor deadlines. The village of Beit Liqya, close to Ramallah, received from FIFA a new natural grass football field in an already-existing football field, but while the village without any available land is fully in Area “A”, the field itself is partly located in Area “C”. As a consequence, the so-called issue of “coordination”, in fact the process to obtain a permit, was submitted to “security” considerations, and the project was forfeited. Sa’ad Sayel Stadium was A FIFA GP project to be built in Nablus. It was approved in 2009, and initiated in April 2012 in the presence of FIFA & PFA representatives. 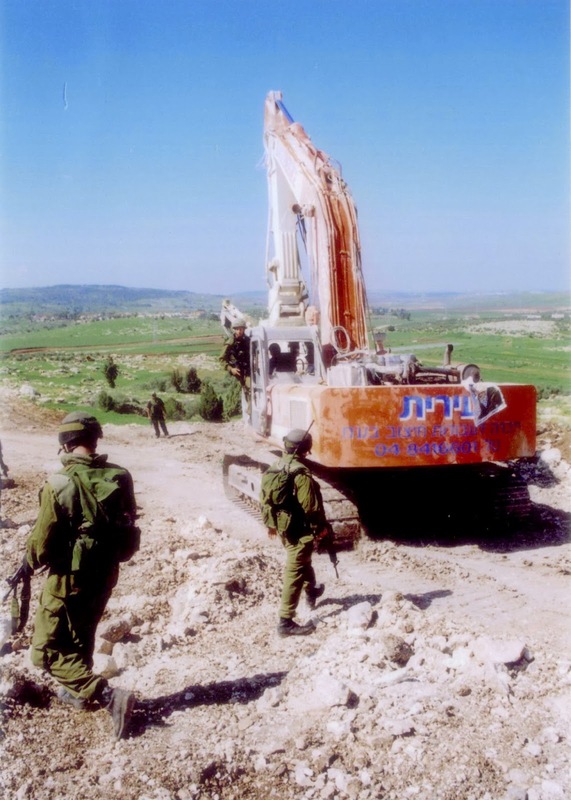 During the 1st phase of construction, an Israeli armed force, backed by the Israeli Civil Administration Office, and without any warrants, stormed the construction site and ordered the halt to all construction work, under threat of arresting the workers and confiscating the machinery. 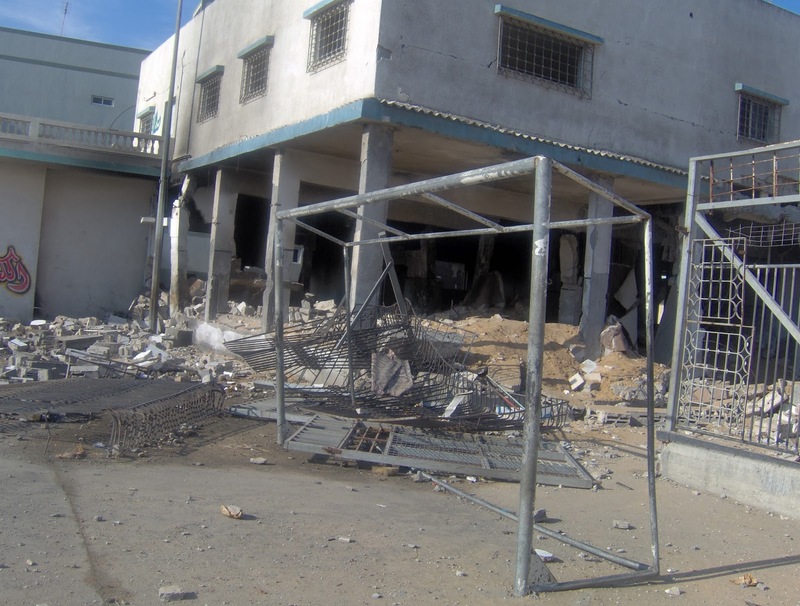 It is to be noted that several meetings had been held between the Palestinian Ministry of Civil Affairs and the Israeli DCO in Nablus to coordinate the implementation of the project prior to the attack. Beit Ummar Stadium/Hebron: The Israeli side argued that the proposed stadium poses a threat on Israeli security, since it borders road #60, and in the event that 10.000 spectators were present, there was a chance they might decide to throw stones on the passing Israeli cars. They also said that such a number of spectators would cause a traffic jam in the junction and the main road. The Palestinian side proposed solutions to said security concerns, saying that the PNA will take responsibility whenever a game is staged, and will provide security forces in numbers enough to prevent any problems before they occur, that if they do. And, as a further precaution, a street will be paved by the Municipality from the northwestern side, which will be the main entrance to the stadium. No entrance will be made on the side of road #60, and no cars will be allowed to park on that side. 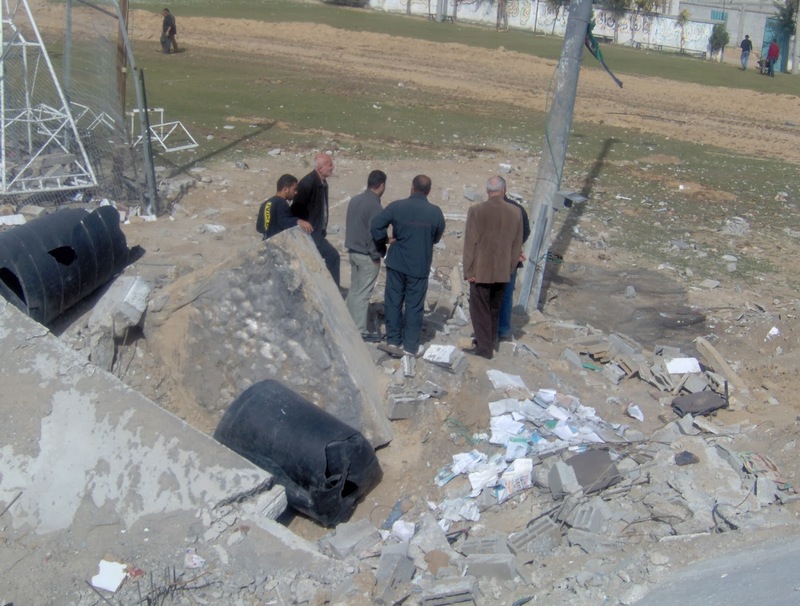 Furthermore, the Palestinian side said it is possible to build a fenced wall on the side of road #60. The Israeli side stuck to their statements and asked that the Palestinian side choose another piece of land. 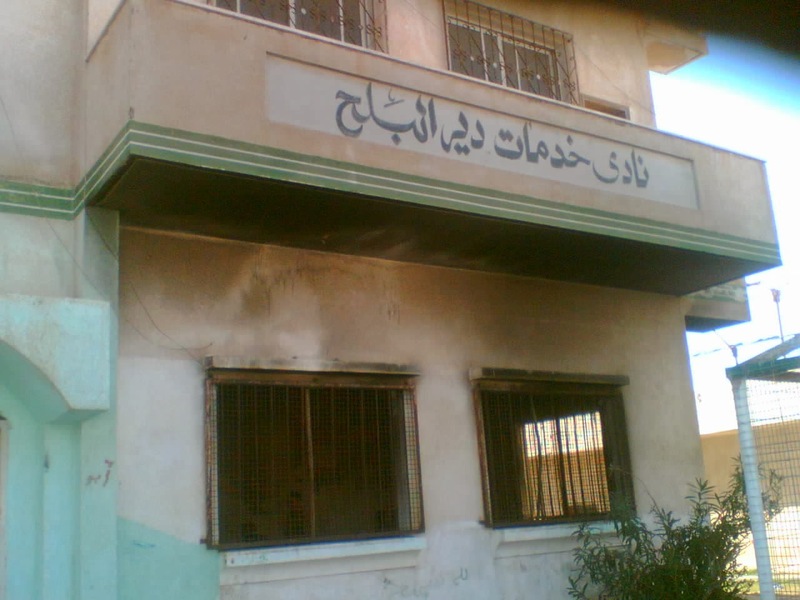 Consequently, the PFA decided to move the GP from Beit Ummar to Burin, which is located in zone “A”. 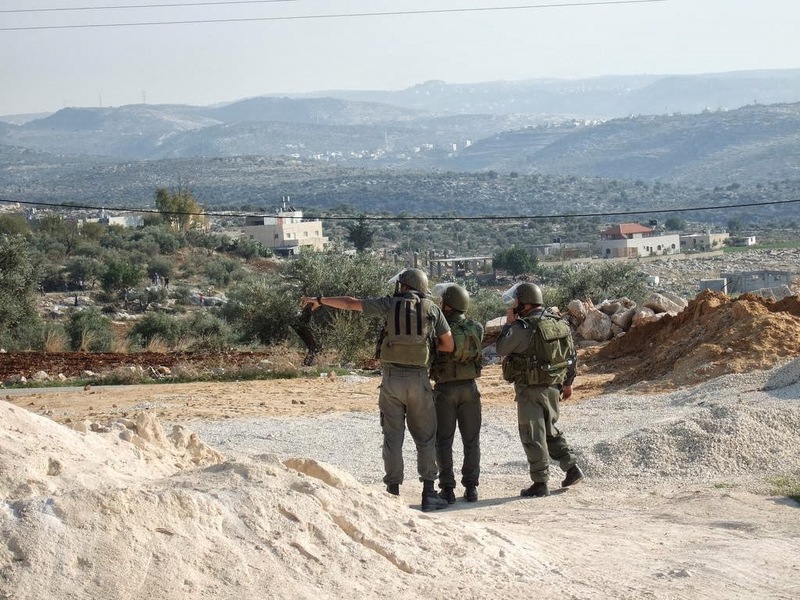 Burin: Following the problem in Beit Ummar, the PFA selected the site of Burin (near the city of Nablus) which is within an area allotted to a school clearly located in zone “A”, all the documents requested by the Israeli side were given to them. 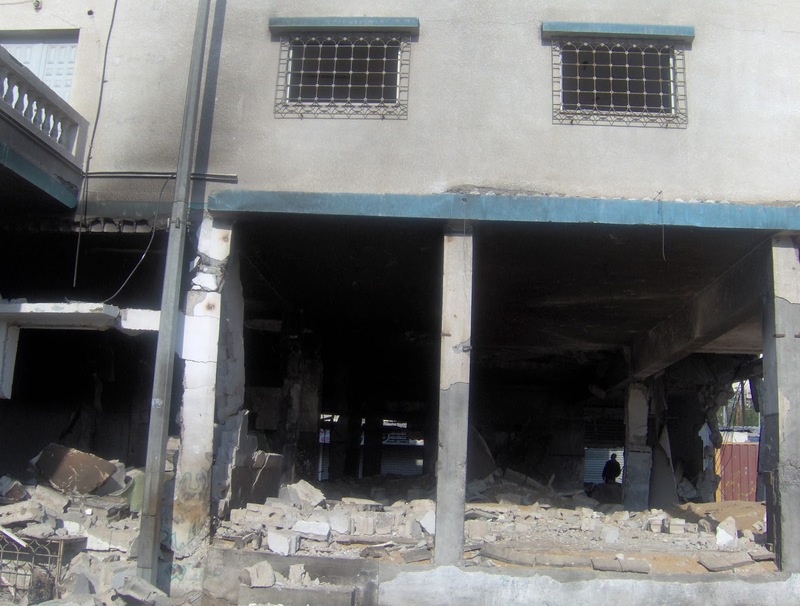 After a few days, an Israeli force stormed the location and blocked the preparatory works. 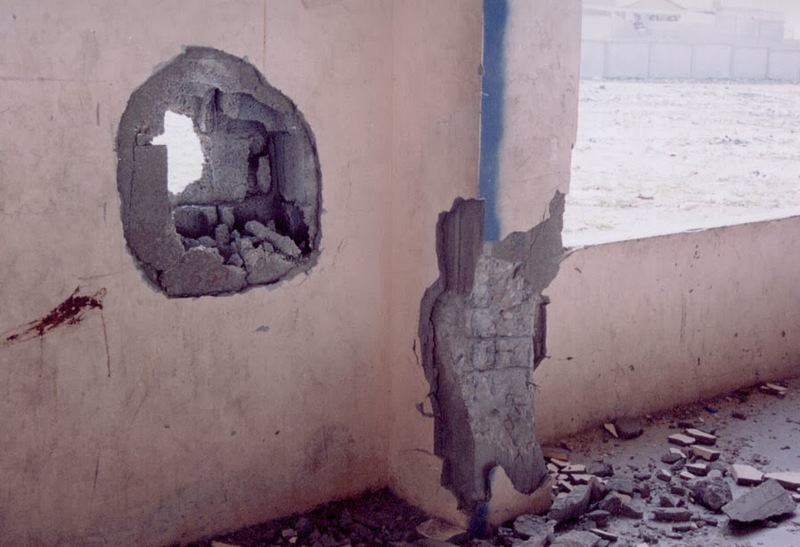 On the 23rd of August 2010, the security officer and maintenance staff of Faisal Al- Husseini Stadium were surprised by a sudden visit from an Israeli armed force, following one of the matches. The force included 3 officers and 15 soldiers. They directed several questions to the stadium’s security officer about the Stadium, the teams, and the security officers that were there during the match. The force left after their questions were answered only to return after midnight at 12:30 with a larger force that conducted a search of the players’ change rooms. They departed and returned again at 3:00 am to take photos of the pitch and the scalars from several angles. 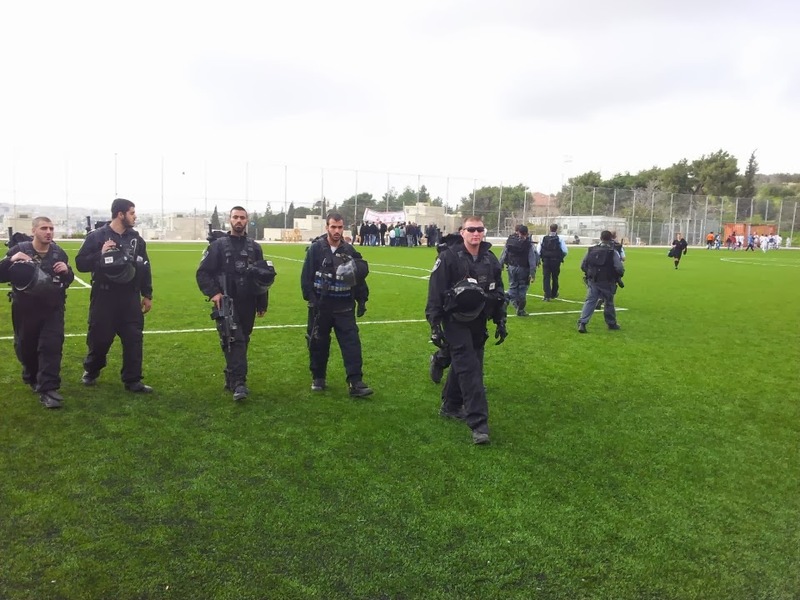 On the 4th of March, 2013, a joint force of Israeli special troops and intelligence officers broke into Jabal AI-Zaitun pitch, located in AI-Tur village, near Jerusalem, during an official U14 league match between Jabal AI-Zaitun and Nadi ai-Moathafin clubs. The fully-armed force threatened the two children teams, their parents, the staff and spectators that they will revert to the use of force and arrest them if they did not clear the premises at once. 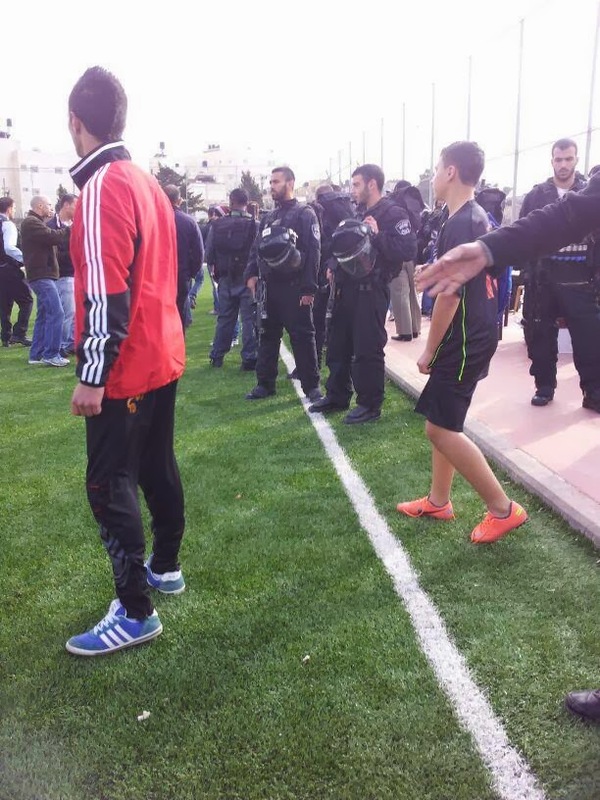 The Israeli force then closed the pitch and issued a warning that prohibits anyone from returning to the place in the future. On the 17th of August 2013, the head of Security in Al-Khadr stadium reported that Israeli Army Patrols have been intensifying their presence in the vicinity of the stadium for the last four months; placing checkpoints on the road leading to the stadium, and interrogating employees, and spectators, about training and match schedules. The provocative presence of these forces caused an incident on the 6th of August 2013, during the final match of Yasser Arafat’s Cup, when a clash ensued with some boys, and Israeli forces started tear-gassing the vicinity of the stadium. Same forces assaulted spectators and Palestinian Security forces. 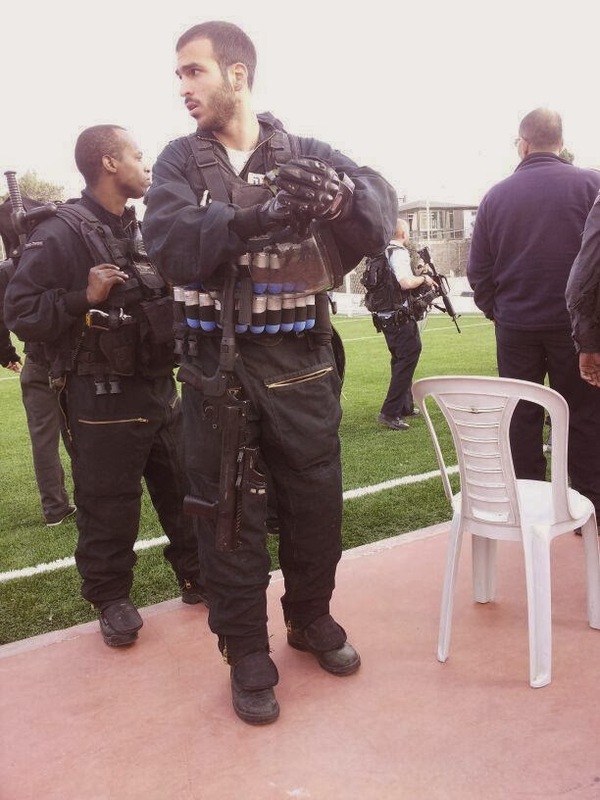 On the 16th of August, 2013, Israeli Security forces informed Al-Khadr stadium security that they will storm the stadium if they were provoked in anyway. Shipments usually enter Palestine through either Jordan or Israel via Israeli ports or Ben Gurion Airport. A letter from the donating sport institution stating the use of the shipment. A document indicating the name, the telephone number and the full address of the donor. A docment indicating the name, the telephone number and the full address of the recipient. A letter from the Palestinian customs authority to the Israeli customs authority requesting the clearance and the release of the equipment. A detailed list of the shipment items with numbers of pieces for each item, size, brand, etc. In the past years, on several occassions, donated equipment sent by FIFA, AFC, and UEFA has not been received or was released only after the payment of exorbitant fees. An agreement was reached in 2009 between the Palestine FA and two top Brazilian clubs to play a match of peace in Palestine on the 15th of September of the same year. The match was, however, cancelled under pressure from the “Israeli Confederacy” headed by Fernando Lutenberg. An attempt to organize a friendly match with Zambia in September-October 2011: The Israeli authorities interfered politically with the government of Zambia to discourage the playing of the match. (Full record of correspondence is in the safekeeping of the PFA), though an agreement was reached between the associations of Palestine & Zambia. A 2nd attempt with Central Africa Republic in October 2011 was also thwarted through intervention on the highest political levels. A 3rd attempt with Zambia on 17 November 2011was cancelled upon instructions of some “State House”. A football team from South Africa, which was supposed to participate in the Youth Week, organized by the Palestinian Higher Council for Youth and Sports (HCYS), cancelled its flights after being informed by the Israelis, via the Embassy of South Africa in Tel-Aviv, that Palestinian territories are “not safe”. The Palestine Football Association has been complaining to FIFA ever since about the Israeli Government intervention in the affairs of football, warning that, if not addressed by FIFA, this intervention could become general practice. The Israel Football Association (IFA), backed by the Israeli Government, has been illegally administering football in the occupied Palestinian territories, in breach of FIFA statutes, and in violation of the rights of both the Palestine Football association, and the owners of the lands upon which football is played. 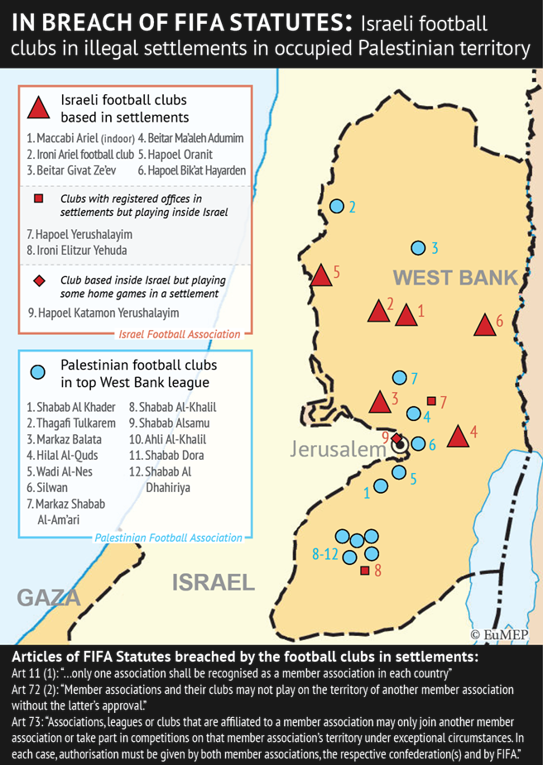 There are at least 6 illegal settlement football clubs registered in the official league run by the IFA, including Ma’aleh Adumim, Kiryat Arba, Givat Zeev, Bikat Hayarden, Oranit and Ariel. 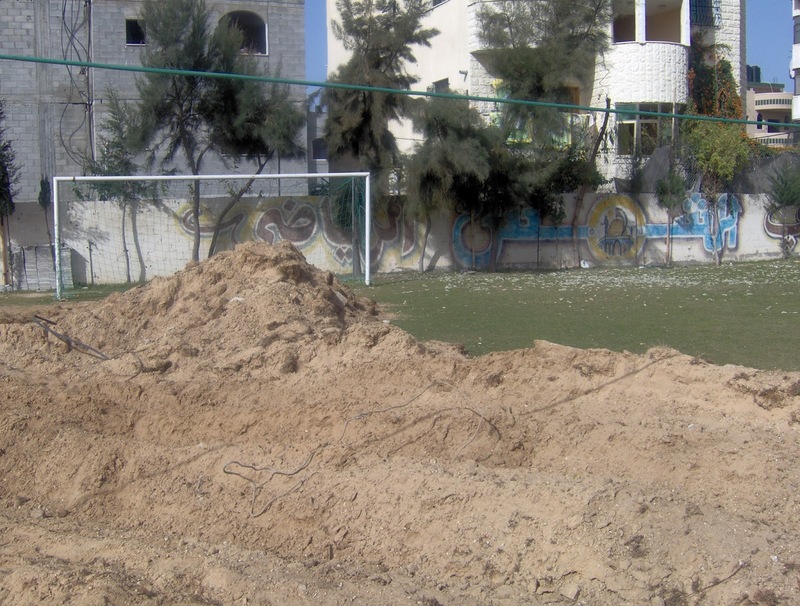 The pitches and facilities used by the settlement clubs are constructed on stolen Palestinian lands, and the owners of some of them have documentation to prove it. Furthermore, the facilities and matches are open to only Israelis. Palestinians are only allowed access as workers. One fact worthy of further study and observation, that the writer elected to keep to the conclusion of this paper is that, at the same time that the Israeli occupation gives Israeli settlements full licence to illegally organize sport activities and build sport infrastructure in the occupied Palestinian territories, it systematically suffocates and prohibits any Palestinian sport related activity or the building of any sport facilities in occupied east Jerusalem, which -according to international law- is not part of Israel. The Israeli Municipality of Jerusalem, aided by Israeli police, systematically close clubs, sport facilities, and prevented the building and maintenance of sport infrastructure by force. 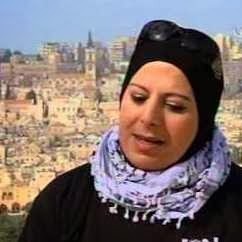 Ms. Mona Barbar, an employee in the Palestinian Higher Council of Youth & Sports, was arrested by the Israeli Authorities in 1/3/2013 with other people. Her charge was “organizing sport activities in east Jerusalem”. 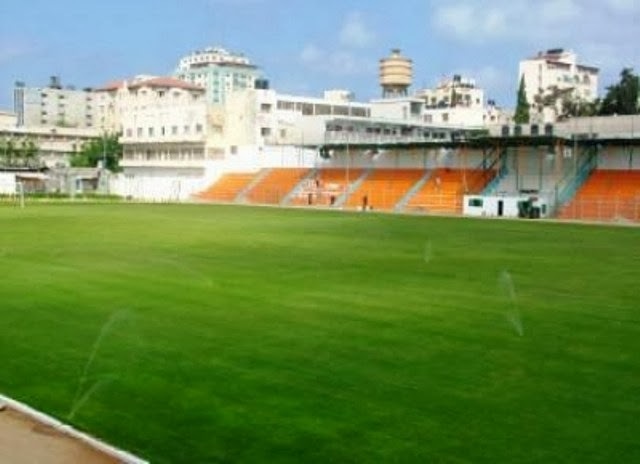 In 2007, the Israeli municipality of Jerusalem attempted the confiscation of the land on which the football pitch is located, to convert it to a parking lot. The owners of the land with the help of Wadi Helweh committee, raised an objection to the Israeli court of local affairs, and stopped the measure. In 2009 the owners were able to register the land as public utility for the children of Wadi Helweh/Silwan, with the approval of the Israeli central court. 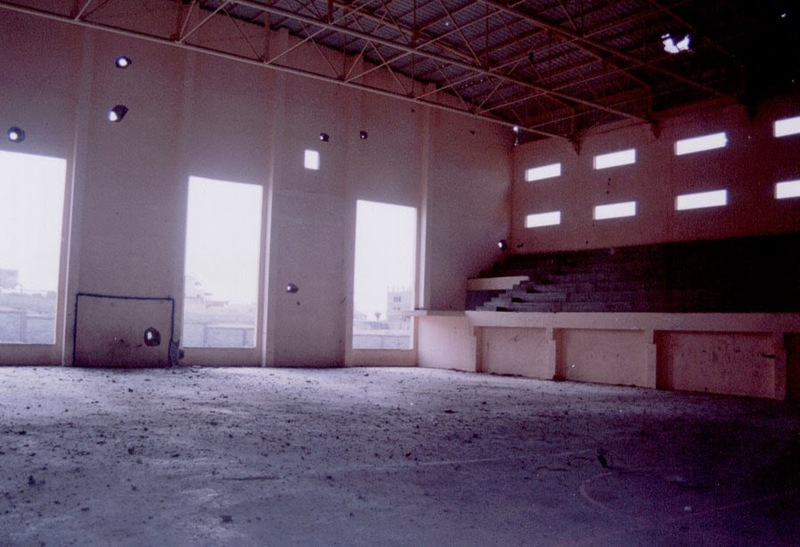 In 2009, the inheritors of Mr. Attalla Siam donated an adjoining piece of land (1.5 acres) to the “MADA creativity Centre”, to build a playing ground and facilities for the benefit of local children, with aid from the MECA Foundation. 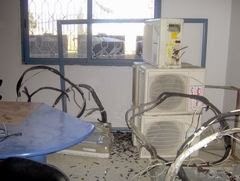 In 2012 the Israeli “Natural and Parks Authority” stormed the football pitch without any warrant, under the pretexts of (garbage removal), and (cleaner earth), and demolished several facilities, including the “culture café”, stores, and WC units. 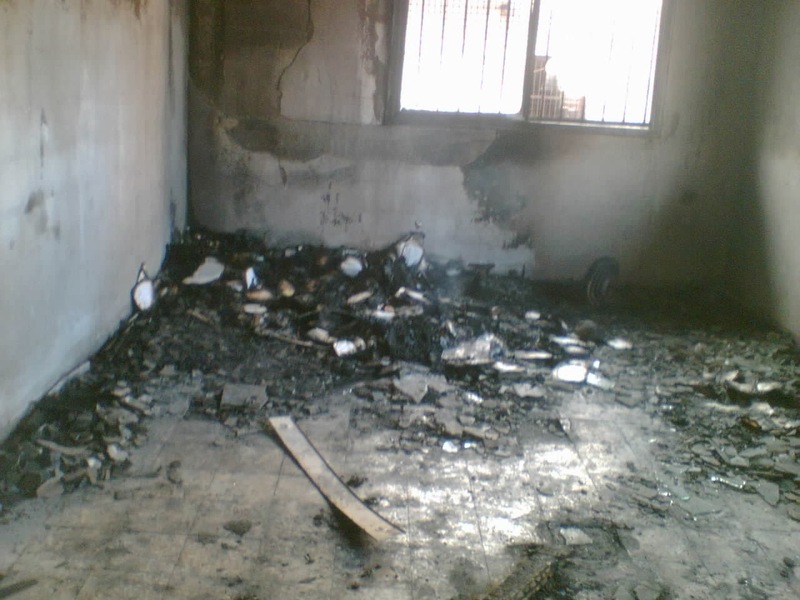 In 2014, the land was burnt by unidentified assailants. 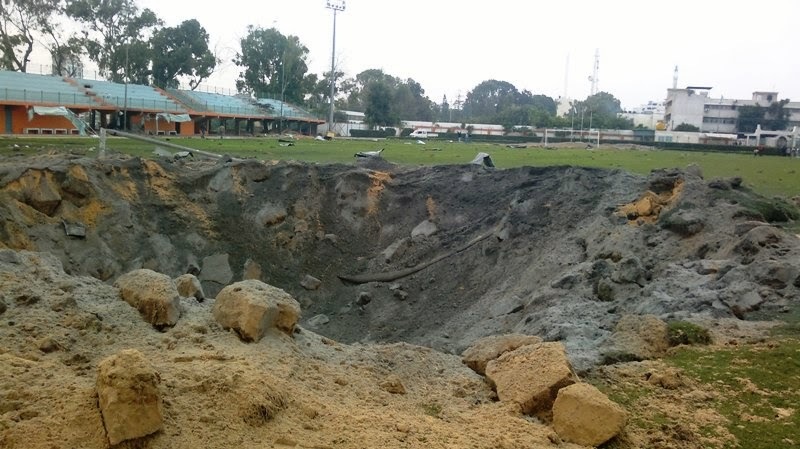 Later, in early June 2015, the Municipality court of local affairs, issued a decision to remove and demolish the “Wadi Helwi” football pitch and all its adjoining facilities, (an area of 15 square meters, and a stable of 40 square meters) in addition to bulldozing crops and asphalt.